Synopsis: Whether or not you believe in fate, or luck, or love at first sight, every romance has to start somewhere. 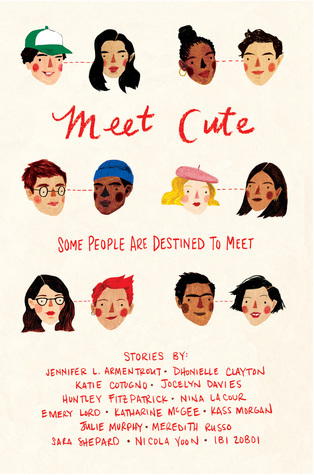 MEET CUTE is an anthology of original short stories featuring tales of “how they first met” from some of today’s most popular YA authors. Readers will experience Nina LaCour's beautifully written piece about two Bay Area girls meeting via a cranky customer service Tweet, Sara Shepard's glossy tale about a magazine intern and a young rock star, Nicola Yoon's imaginative take on break-ups and make-ups, Katie Cotugno's story of two teens hiding out from the police at a house party, and Huntley Fitzpatrick's charming love story that begins over iced teas at a diner. There’s futuristic flirting from Kass Morgan and Katharine McGee, a riveting transgender heroine from Meredith Russo, a subway missed connection moment from Jocelyn Davies, and a girl determined to get out of her small town from Ibi Zoboi. Jennifer Armentrout writes a sweet story about finding love from a missing library book, Emery Lord has a heartwarming and funny tale of two girls stuck in an airport, Dhonielle Clayton takes a thoughtful, speculate approach to pre-destined love, and Julie Murphy dreams up a fun twist on reality dating show contestants. Not really sure how this book ended up on my TBR, but it did. (I probably saw that Jennifer L. Armentrout contributed and added it tbh.) Anyway, I was in the mood for some cute contemporary summer feels and this was the first one that popped up on my TBR. I read the synopsis and some Goodreads reviews and was automatically put off, but I decided, eh, it's available from my library and I've got nothing else better to read that will fulfill my need, so why the hell. Some of these stories were really good and blew my mind while others were truly awful. I love meet cutes despite hating insta love so it was interesting to see how these authors tackled the topic. So without further ado, below are short thoughts on each of the short stories. This is one of the stories that I thought was truly awful. It was in 2nd person POV and that automatically put me off for the book. I didn't think the story was cute, I thought it was cruel. I really didn't like how the story was in 1st person POV but used "you" as if talking to the reader as a part of the story. The idea iwas kinda interesting in general but there were hardly any real feels or romance. I thought the story was incredibly anti-climatic. It was not even remotely a meet cute. I thought this was a nice meet cute. I thought it was a cute meet cute but it was incredibly unrealistic. I got asexual vibes in the beginning but that turned out to not be right, so I was a little sad. I absolutely loved the whole love coil idea. The "myth"ology aspect of this story was just incredibly interesting and I feel like this story could have an entire book of it's own. I really dug the whole library scenario. I was not disappointed by Jennifer L. Armentrout, she definitely delivered. This was hands down my favorite story in the anthology. The whole subway scenario is one I have also dreamed about and I love how it incorporated math into it. I would love to have a mute cute that went down like this one. I liked it until the end and then it fell flat for me. Eh, I thought this one was alright. I thought the premise was good but the execution fell flat. This was a very interesting concept and I would love for this to be explored more in a full fledged book. So those are my thoughts on all of the stories. Overall, I didn't feel like I wasted my time and definitely got my fill for some cute feels.